Previously and previously. Will it be third time lucky? I’m going to document the steps from the start. Note I’m building this on the hardware, not cross-compiling, since the ODROID-XU (Exynos 5410) with an external hard drive is fast (for ARM). Also note you’ll need to make your own serial port or buy one. Reboot, and be ready to interrupt u-boot by hitting a key on the serial console at the right moment. [    0.390000] CPU: All CPU(s) started in SVC mode. [    5.780000] systemd: Running in initial RAM disk. Welcome to Fedora 20 (Heisenbug) dracut-034-19.git20131021.fc20 (Initramfs)! [    5.810000] systemd: Caught , dumped core as pid 1220. [    5.820000] systemd: Freezing execution. Now that I have made my own serial port for the ODROID-XU, creating something omitted from this development board, I’m ready to try to compile my own kernel again. At least I should be able to debug any error messages this time. I boot this by interrupting u-boot and typing the load commands by hand. (Note that /boot/uboot is a FAT partition). [   17.680000] systemd: No control group support available, not creating root group. [   17.720000] systemd: Starting -.slice. Expecting device dev-disk-by\x2du[   17.730000] systemd: Caught , dumped core as pid 1144. [   17.730000] systemd: Freezing execution. Update #2: See the comments section. Update: It’s because the 3.11 kernel doesn’t support the MMC card. I’ll try later using an external USB drive. Now that I’ve made a serial cable I can now show you the full boot messages starting from U-Boot. As I’ve said before, developer boards should come with all the bits, and a UART is essential for development on ARM. 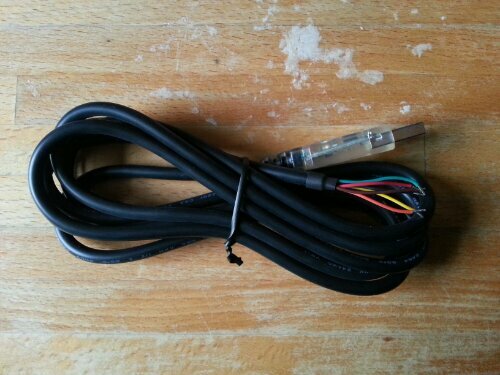 I built my own using the jump leads from an unused CP2102, and this 1.8v FTDI serial to USB cable purchased previously. The ODROID-XU board has a four pin Molex-type UART connector. The pin-out is: 1 = Power (do not connect), 2 = RX, 3 = TX, 4 = Ground. Pin 1 has the triangular notch on the outside of the connector. In the photo above, black is connected to pin 4 (ground), blue is connected to pin 3 (TX), and purple is connected to pin 2 (RX). 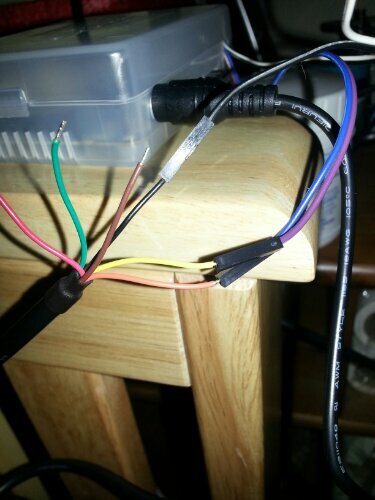 The FTDI cable has: Black = ground, Yellow = RX, Orange = TX. Normally I would swap RX & TX in the cable, but that didn’t work here, so as you can see I’ve connected RX-RX, TX-TX straight through. The photograph shows the connection before I wrapped the whole lot in many layers of black electrical tape. The UART to USB cable didn’t work out. It’s not possible for humans to connect those wires to the Molex header, and the only option to make it work is to buy a Molex 5268 connector from somewhere (nowhere in the UK sells them, so I guess abroad for lots of money). Repeated note to all potential sellers of ARM “development” boards: Put a fscking serial port on it. This documents how I compiled a more recent kernel for the ODROID-XU. The good news is the hardware is pretty fast, and it doesn’t take long to compile a kernel. The bad news is it doesn’t boot with the new kernel, and because of the complete lack of debuggability, it’s impossible to find out why. I first checked out the hardkernel git repository’s 3.11-rc7 branch. Some explanation: The upstream Linux kernel doesn’t have support for the Exynos 5410 SoC, nor for many of the peripherals on this system, and so hardkernel (the makers of ODROID) maintain a set of patches on top of the upstream kernel which they rebase periodically. In this case there are approximately 60 extra patches on top of the upstream 3.11-rc7 kernel, starting with this patch to add basic support for the 5410 and continuing by adding more and more peripheral support. Note that the u-boot configuration shouldn’t need to be modified, and in any case the configuration is signed by hardkernel so it cannot be modified (GRRRRRR, another reason to hate this hardware). And now reboot and hope for the best. If it doesn’t come up, then you have to pull the SD card, plug it into a real computer, and switch back to the *-official* files that you backed up above. As discussed before there is no serial port or monitor, so these failures are not debuggable.